All it takes is a simple layer of protection. Elevators. Restrooms. Display areas. Architectural elements. 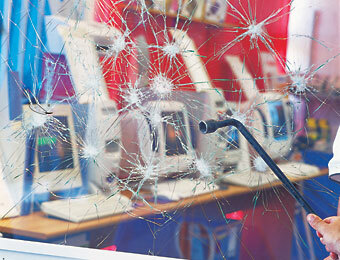 Virtually any high-traffic area with windows or other surfaces is vulnerable to costly vandalism. In the case of windows, there's the additional threat of "smash-and-grab" thieves, who rely on fast access through your facility's broken glass to get their job done. Now, you can help foil destructive efforts, with Llumar Magum safety and security film. The Llumar Magnum solution is simple: It's a heavy-duty polyester film bonded by special adhesives that's simply applied to the interior of new or existing glass... with powerful results. Are your windows part of the problem? Llumar offers your windows and other surfaces a simple and inconspicuous defense against vandals: A protective film that helps prevent scribing and other defacing of your base surface, yet one that vandals won't even know is there. If vandals leave their mark, the film can be peeled off and replaced easily, eliminating graffiti -- and the need for costly glass replacement. Llumar Magnum is a powerful deterrent to smash-and-grab thieves as well. It forms a strong but virtually invisible shield that holds broken glass in place -- delaying and deterring perpetrators whose goal is quick entry through shattered windows. Llumar Magnum is simply installed on everything from showcase windows and display cases to bathroom mirrors, subway doors, and elevator and building interiors. And, it's easy to maintain using conventional window-cleaning methods.